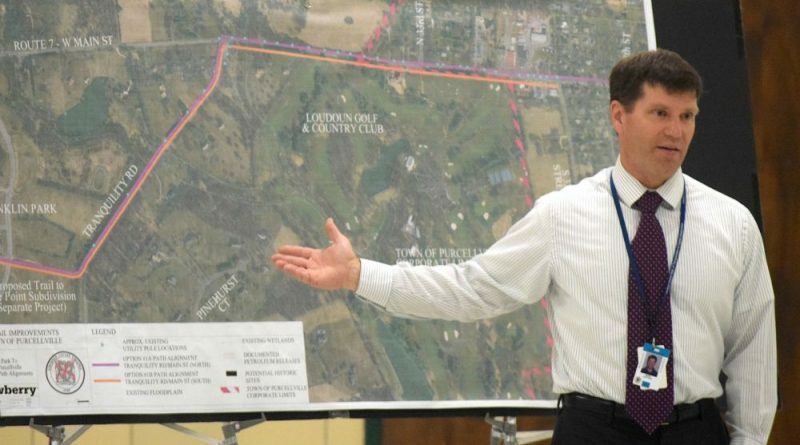 Mark Hoffman of the Loudoun Department of Transportation and Capital Infrastructure discusses options for a new trail between Purcellville and Franklin Park during a June 7 community meeting. About two dozen Purcellville area residents gathered at Emerick Elementary School on Wednesday night to learn more about plans to build a pedestrian and bicycle trail between the town and Franklin Park. The project is the early stages. No construction is planned before 2021. County staff members are taking a new look at the concept after an earlier effort, about 15 years ago, ended without agreement on an alignment. At that time, planners had an idea to extend the W&OD Trail westward from its Purcellville terminus, but found the former railroad right of way had been abandoned and private landowners along the route unwilling to accommodate a new trial. Now, the planners are looking at a 1.1-mile route from the park’s swimming pool complex, following along Tranquility Road and then connecting with the sidewalk on Main Street at South 32nd Street. The main question is whether the path would be built on the north or south side of Rt. 7 Business/Main Street. On the north side, the path would cut across the front yards of 25 properties and could require up to 33 utility pole relocations. On the south, the trail would require right of way from 17 properties and could require up to 11 utility pole relocations, but also may encroach on existing tees and greens at the Loudoun Golf and Country Club. Another option of crossing the Farmington on the Greens neighborhood was taken off the table because of residents’ opposition. A formal public comment period will continue until July 7. The Board of Supervisors has earmarked $5.5 million for the project. Project planners hope supervisors will pick an alignment this fall so design can begin next winter. “We’re really early in the process,” Supervisor Tony Buffington (R-Blue Ridge) said. He hopes to work with residents and the staff to build consensus on the best way forward. Construction is about to start on another trail project that will link Franklin Park to the Town of Round Hill. That work comes after a decade of planning. 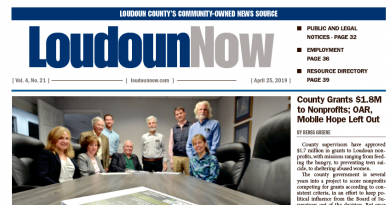 For more information about the project or to provide comments on the Franklin Park to Purcellville Trail alignment, contact Gary Pozzouli at gary.pozzouli@loudoun.gov.